There has been quite a turnaround in personnel for the fourth outing of Masterpiece, which returns to its swaggering pavilion on the South Grounds of the Royal Hospital, Chelsea, from June 27 to July 3. The pavilion, as before, is a virtual extra wing for the Hospital, created by Stabilo, the firm responsible for building the Maastricht stands, and it should make the ghost of Sir Christopher Wren smile at the homage. There seem to be a few fewer exhibitors this year-about 160 – but 52 are new, more than half coming from overseas. Another change from the early days is that, where the organizers appeared to find the word ‘art’ embarrassing, and ‘antiques’ impossible to utter, and ‘luxury’ was everything, now encouraged by the new chief executive, Nazy Vassegh, the talk is all of ‘the Masterpiece arts fair’. The order of precedence in publicity material is encouraging: ‘The fair will present the finest art, design, antique furniture, precious jewels and vintage cars… art, craftsmanship, culture and connoisseurship from the ancient civilizations through to the present day.’ The layout has been amended to reflect this, with the cars and a classic boat stand, for instance, relocated to the outer rim, so that the art will not be overwhelmed by the luxury. The approach to the fair will no longer be just a pleasant (or damp, as may be) walk through the grounds. Adopting a feature of the Art London fairs that used to take place here, there will now be a Sculpture Walk with 11 works by major international artists leading from the Hospital gates to the pavilion’s entrance lobby. Refreshments are in the hands of Urban Caprice, and there will be a Midsummer Party on July 2 in support of Marie Curie Cancer Care. There will also be talks during the fair on behalf of the cultural beneficiary, the Courtauld Institute. To begin at the beginning, the top London antiquities specialists Charles Ede and Rupert Wace are joined by the Ariadne and Merrin galleries from New York, Cahn from Switzerland and Chenel from Paris. Along with medieval works of art, Sam Fogg also has antiquities, including a marble roundel with a 1st century AD profile relief of the Emperor Nero. Among the early sculpture and objects of art on Mullany’s stand is a classically inspired item made for a Renaissance collector in the mid to late 15th century. This is a richly patinated bronze oil lamp decorated in relief with a sacrifice to Priapus. 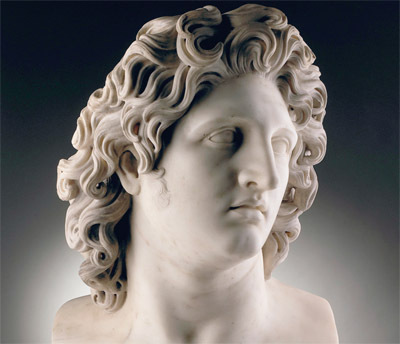 A later bow to the Antique is a bust of Alexander the Great with Tomasso Brothers. It was modelled after a Roman original (now in the Capitoline Museum) in the 18th century, and is attributed to the workshop of Bartolomeo Cavaceppi, the foremost supplier of such things to the Grand Tourist trade. It is rare for me to write about jewels, because, however beautiful, few have very many words in them. Here, however, are two exceptions. The first is the Mary Tudor Pearl, and the second the Maharaja Sunset, a Golconda diamond ring. The tear-shaped 64.5-carat pearl, the third largest in the world, is first recorded in 1526 when owned by the Empress Isabella, wife of Charles V. It was part of the bride-price paid by her son, Philip II of Spain, on his marriage to Mary I of England, and it can be seen in her portraits by Anthonis Mor and Hans Eworth. The pearl disappeared from view in the late 16th century, but surfaced at auction in 2004, when it was suggested that it had been in a royal collection. It has now been extensively researched and authenticated by Symbolic & Chase of London, which is showing it, and it will be included in the forthcoming V&A exhibition on pearls. Alas, in the portrait of Mary, perhaps derived from the Mor, brought to the fair by Philip Mould she is wearing a lesser pearl pendant. Mr Mould also offers a Hilliard miniature of an Elizabethan Court lady. The Mogul-cut gold-coloured diamond, weighing 49.31 carats, is offered by Siegelson of New York. The Golconda mines, in southern India, were the source of many of the world’s most superb stones, including the Koh-i-Noor, the Hope and the Regent. To come up to the present day, by way of 1978, Geoffrey Diner from New York has a witty 72in by 60in Roy Lichtenstein, Puzzle Portrait. It is one of his Surrealist-Pop works inspired by predecessors and contemporaries- in this case, an affectionate tip of the hat to Picasso. It has never been on the market before. 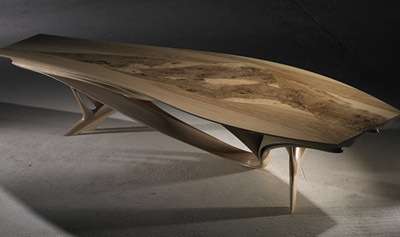 Peter Petrou has a lovely table in olive and ash finished with white oil, commissioned this year from Cork maker Joseph Walsh. Eat your heart out, Majorelle!